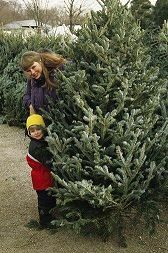 "BALSAM FIR CHRISTMAS TREE CAPITAL OF THE WORLD"
Nova Scotia's cool, moist climate is ideal for growing balsam fir and since the turn of the century, Lunenburg County has been harvesting and exporting these balsams for Christmas trees and wreaths. Because of its lush foliage, fragrant aroma and superior needle retention, Nova Scotia Balsam soon became the tree of choice throughout much of North America. By the 1950's annual exports had exceeded 3.5 million, half of which came from Lunenburg County. Christmas trees and wreath making soon became a way of life of many Lunenburg County families and the knowledge and tradition was passed down from generation to generation. Skilled growers practice natural stand management where "mother" or "seed trees" are left standing to provide replacement seedlings for the mature trees that are harvested. This process makes Lunenburg County unique in its ability to supply trees in a wide range of heights and grades. Trees 30 feet or more are quite often shipped to various markets. The land owners work in harmony with nature to produce an all natural, hand crafted product that has become world renowned and trees and wreaths from Lunenburg are shipped to many parts of the world. Nova Scotia Balsam has truly become "the smell of Christmas"! In 1995, Lunenburg County was officially recognized as the 'Balsam Fir Christmas Tree Capital of the World' and this designation in turn helped to earn the county the 'Forest Capital of Canada' award in 1996.